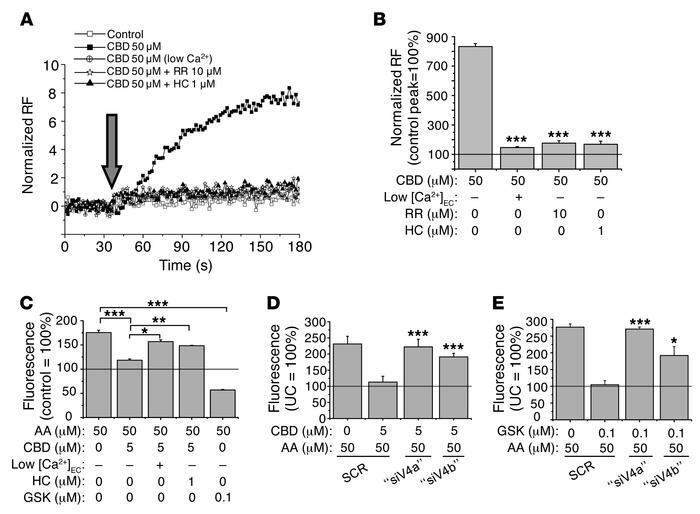 Lipostatic activity of CBD is mediated by TRPV4. (A) Fluorescent Ca2+ imaging. Compounds were applied as indicated by the arrow. Fluorescence (measured in relative fluorescence units [RF]) was normalized to the baseline. “Low [Ca2+]EC” indicates the use of nominally Ca2+-free Hank’s solution. Two additional experiments yielded similar results. (B) Statistical analysis of the fluorescent Ca2+-imaging data. Fluorescence (expressed in RF) was normalized to the baseline. Measured peak values were expressed as the percentage of the baseline (mean ± SEM of 3 independent determinations). The solid line indicates 100%. Two additional experiments yielded similar results. ***P < 0.001 compared with the CBD-treated group. (C) Neutral lipid synthesis (Nile Red staining). Data are expressed as the percentage of the vehicle control (mean ± SEM of 4 independent determinations). The solid line indicates 100%. Two additional experiments yielded similar results. “Low [Ca2+]EC” indicates the use of low-Ca2+ Sebomed medium. *P < 0.05, **P < 0.01, ***P < 0.001. (D and E) Neutral lipid synthesis (Nile Red staining) following selective gene silencing of TRPV4 channel (24-hour treatments, started at day 3 after the transfection). Data are expressed as the percentage of the untransfected vehicle control (mean ± SEM of 4 independent determinations). The solid line indicates 100%. Two additional experiments yielded similar results. *P < 0.05, ***P < 0.001 compared with the SCR cells. “siV4a” and “siV4b” mark 2 different siRNA constructs against TRPV4. SCR, scrambled control; UC, untransfected vehicle control.